Loosen the front wheel axle pinch bolt, then the wheel axle and the brake caliper bolts. Lift the front wheel off the ground according to the procedure. Remove the speed sensor lead holder by removing the bolt. Remove the brake hose holder by removing the bolt. Remove the brake caliper by removing the bolts. Pull the wheel axle out, remove the speed sensor by pulling it out, and then remove the wheel. NOTICE: Do not apply the brake after the brake calipers have been removed, otherwise the brake pads will be forced shut. Lift the wheel up between the fork legs. Install the speed sensor at the wheel hub. 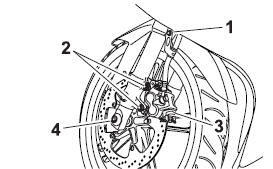 Make sure that the projections on the speed sensor rotor are aligned with the notches in the wheel hub and that the slot in the speed sensor fits over the retainer on the fork leg. Lower the front wheel so that it is on the ground. Push down hard on the handlebar several times to check for proper fork operation. Install the brake caliper by installing the bolts. Make sure that there is enough space between the brake pads before installing the brake caliper onto the brake disc. Install the brake hose holder by installing the bolt. Install the speed sensor lead holder by installing the bolt. Tighten the wheel axle, front wheel axle pinch bolt and brake caliper bolts to the specified torques.